Time to wrap up on these shadow puppets related posts! In Episode 14: Tofu, Mac and Cheese and Bottle Monster talk about how Soy Milk is made. There’s a dramatization of the whole history and I was originally going to do it using flash animations. Later I decide that it would take me too long. So what’s the alternative? I was going to do paper cutouts and then move them around as puppets, and then an idea hit me: why don’t I do shadow puppets instead? That was definitely an exciting idea for me. I decide to do this in the style of Chinese shadow puppets. You need three things, essentially. You need a screen, some puppets, and a light source. I already have a lamp (duh) so now all I need is a screen and some puppets. In Chinese shadow puppetry, the screen is traditionally a thinned layer of animal skin. I guess back then that was the best material they can find. Nowadays it’s probably some synthetic material. Either way, it needs to be semi-transparent. It should be transparent enough to show the shadows and opaque enough so the sticks, rods, and puppeteers controlling the puppets are not showing. Originally I was considering using tracing paper but I couldn’t find any in my local pharmacy. I just decided to go with a piece of paper towel. That’s probably the best choice at my place that’s the right degree of transparency. Instead of a fancy stage, I was just going to make some kind of frame out of cardboard. After all, this is going to be on video, not in front of a crowd. 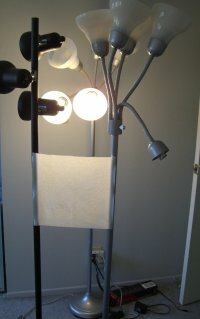 And then I realized that I should just tape that paper towel between two lamps (apparently I have quite a few lamps in my room due to all the filming I do). Shine a light (or two) behind it and that’s our screen. 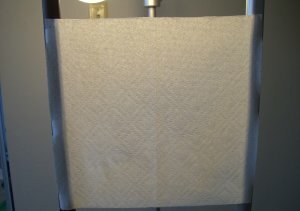 So, was paper towel a good choice? Yes and no. It was the right degree of transparency I want. It was the right size. It was easy to obtain, and it even has an interesting texture to it. But there is a problem: The puppets tend to get stuck in it. In that case, maybe other kind of paper that offers a smooth surface would’ve been a better choice. The puppets probably would’ve moved a little more if I wasn’t having trouble unsticking them, particularly with the shot in which an arrow or spear was flying across the scene. I didn’t really try this out, but I think tracing paper would’ve been a much better choice. If that was too transparent, you can always layer it with a piece of paper towel. Maybe printing paper would work, too, but I didn’t try. Again, traditionally they are made of leather due to the lack of other durable materials. Since I don’t have leather and I’m not about to go buy any, I use what I use all the time: index cards. I seriously use index cards for everything. I use them to write to-do lists that I carry around in my pocket. I use them to write down directions when I go somewhere. I use them for puppets’ eyes. And then now I am using them to make shadow puppets. First you want to draw your design on the index card. I use a permanent marker. Now you want your design to be connected and in one piece. Look at this following picture. The face on the left has all the parts connected so it’s one piece. The one on the right is not a good design, because once you cut out all the white parts, the eyes and mouth will fall out. And a blank face is just not flattering in any way. Once you have the design, carefully cut out all the white parts with an Xacto knife . I bought mine at a local pharmacy. 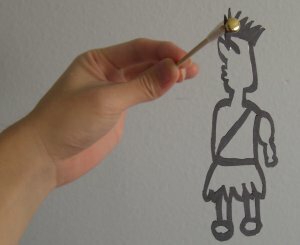 And then you want to attach the paper cut out to a stick/rod. I use bamboo skewers… same thing I used for arm rods for the other puppets. In this picture, the paper fastener go through a hole on the paper cut-out and then I tape the paper fastener to the bamboo skewer. Later I decided that these paper fasteners look a little too big, and the purpose for using them is to make the puppets more flexible for motions, but that was kinda lost when they are stuck in the paper towel. I started to leave small tabs on top of the cut-outs so I can just fold that little tab over and tape it to the bamboo skewer. Normally I would probably use a glue gun but someone borrowed it at that moment. So that’s it. Put the lights behind the screen and then put the puppets in between. Now let the show start!